With the arrival of President Hugo Chávez in 1999, Venezuela embraced Chavismo, a form of Andean socialism. In 2013, Chávez met the Grim Reaper and Nicolás Maduro assumed Chávez’ mantle. Chavismo has not been confined to Venezuela, however. A form of it has been adopted by Rafael Correa – a leftist economist who became president of a dollarized Ecuador in 2007. Even though the broad outlines of their economic models are the same, the performance of Venezuela and Ecuador are in stark contrast with one another. One metric that can be used to compare the two Latin American countries is the misery index. For any country, a misery index score is simply the sum of the unemployment, inflation, and bank lending rates, minus the percentage change in real GDP per capita. A higher misery index score reflects higher levels of “misery.” Using data from the Economist Intelligence Unit, I determined that Venezuela had the world’s highest score – 214.9 – at the end of 2015. It held the ignominious top spot – the world’s most miserable country in 2015. On the other hand, Ecuador had a misery index score of 18.9, which placed it in a slightly better position than the median Latin American country. Why the big difference? It can be explained by the U.S. dollar. Ecuador uses the greenback as its official currency – like Panama and El Salvador – and Venezuela uses the battered bolívar. Prior to 2000, Ecuador was like Venezuela; it used its own currency, the sucre. But, Ecuador (like Venezuela) was incapable of imposing the rule of law and discipline in its monetary and fiscal spheres. The Banco Central del Ecuador was established in 1927, with a sucre-U.S. dollar exchange rate of 5. Until the 1980s, the central bank periodically devalued the sucre against the dollar, violating the rule of law. In 1982, the central bank began to exercise its devaluation option with abandon. From 1982 until 2000, the sucre was devalued against the dollar each year. The sucre traded at 6825 per dollar at the end of 1998, and by the end of 1999, the sucre-dollar rate was 20,243. During the first week of January 2000, the sucre rate soared to 28,000 per dollar. In the case of Ecuador, the inability of the government to abide by the rule of law is, in part, a consequence of traditions and moral beliefs. Ecuadorian politics have traditionally been dominated by elites (interest groups) that are uninhibited in their predatory and parochial demands on the state. With the lack of virtually any moral inhibitions, special interest legislation has been the order of the day. For example, during the rout of the sucre in 1999, laws were passed allowing bankers to make loans to themselves. In addition, state guarantees for bank deposits were introduced. These proved to be a deadly cocktail, one that allowed for massive looting of the banking system’s deposit base. This, as well as the collapsing sucre, enraged most Ecuadorians. With the rule of law (and the sucre) in shambles, President Jamil Mahuad announced on January 9, 2000 that Ecuador would abandon the sucre and officially dollarize the economy. The positive confidence shock was immediate. On January 11th — even before a dollarization law had been enacted—the central bank lowered the rediscount rate from 200 percent a year to 20 percent. On February 29th, the Congress passed the so-called Ley Trolebús, which contained dollarization provisions. It became law on March 13th, and after a transition period in which the dollar replaced the sucre, Ecuador became the world’s most populous dollarized country. I had a front-row seat in Ecuador’s dollarization drama – both as a participant in the dollarization debates that preceded the sucre’s collapse and also during the replacement of the sucre and the greenback’s implementation phase, when I was an advisor to Carlos Julio Emanuel, the Minister of Finance and Economy. As for Venezuela, I had another front row seat, as President Rafael Caldera’s adviser in 1995-96, prior the arrival of Chávez. To put discipline into Venezuela’s monetary and fiscal spheres, I recommended an orthodox currency board – one that would have made the bolívar a clone of the U.S. dollar. Caldera came close to adopting my recommendations. But, in the end, he failed to do so. The elites and special interest groups, as well as a variety of leftists, were opposed to any reform that would introduce the rule of law and impose monetary and fiscal discipline. The failure to adopt the rule of law has been catastrophic. 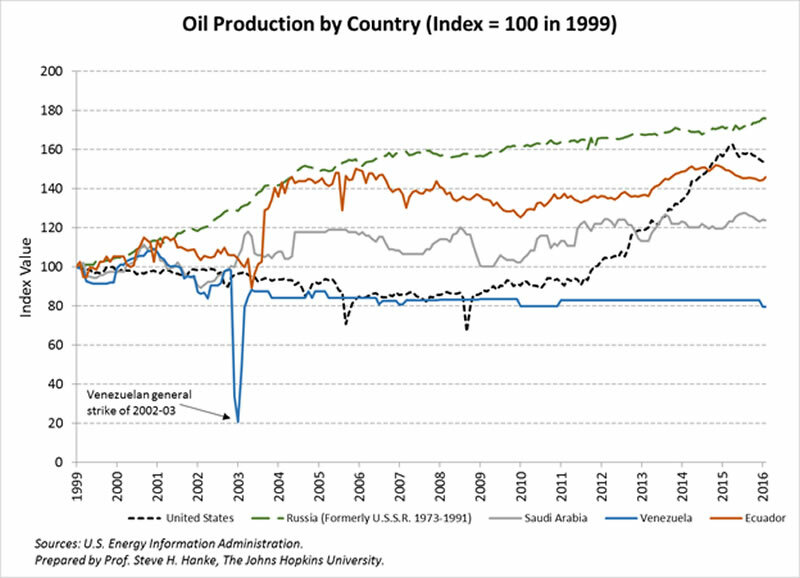 Let’s look at oil production. Venezuela has the largest proven oil reserves in the world – even greater than Saudi Arabia. But, the oil output of Venezuela’s state-owned oil company, PDVSA, is only 80 percent of what it was in 1999 (see the accompanying chart). In contrast, Ecuador’s oil output has jumped in the post-dollarization period and is now over 40 percent higher than in 1999. 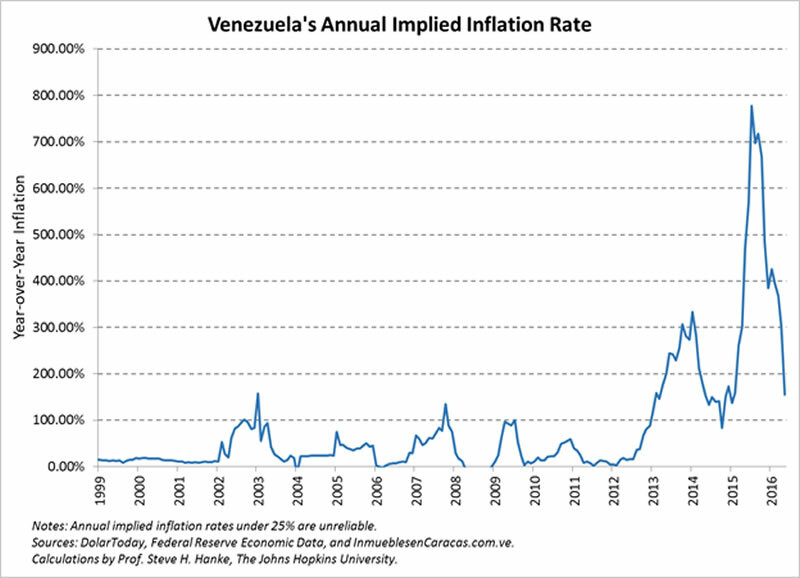 Venezuela’s inflation record under Chávez was dismal, and under Maduro it has been catastrophic. For the past three years, Venezuela’s inflation rate has held the world’s top spot. It reached an annual rate (year-over-year) of almost 800 percent in the summer of 2015 and is 145 percent at present, still the world’s highest rate (see the chart below). In contrast, Ecuador’s annual inflation during the last ten years – dollarized years – has averaged 5.2 percent. The most telling contrast between Venezuela’s Chavismo and Ecuador’s Chavismo Dollarized can be seen in the accompanying chart of real GDP in U.S. dollars. We begin in 1999, the year Chávez came to power in Venezuela. The comparative exercise requires us to calculate the real GDP (absent inflation) and do so in U.S. dollar terms for both Venezuela and Ecuador. Since Ecuador is dollarized, there is no exchange-rate conversion to worry about. GDP is measured in terms of dollars. Ecuadorians are paid in dollars. 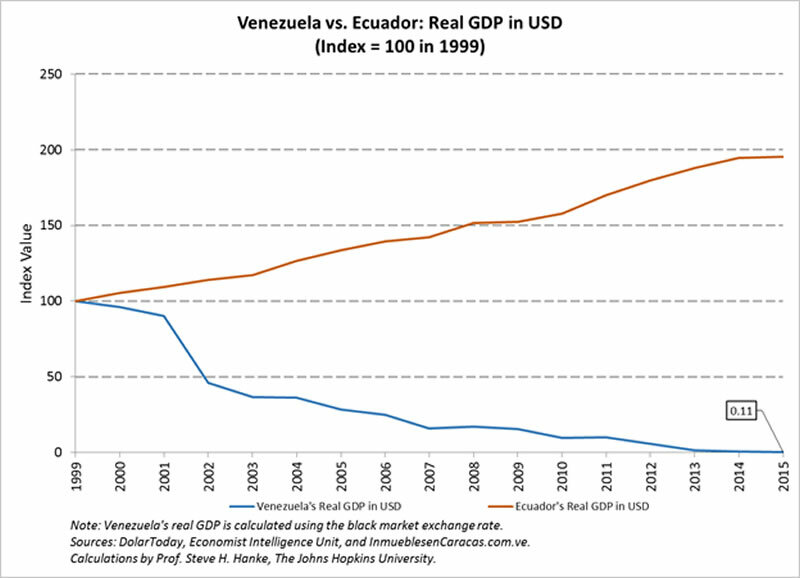 Since 1999, Ecuador’s real GDP in dollar terms has almost doubled. To obtain a comparable real GDP for Venezuela is somewhat more complicated. We begin with Venezuela’s real GDP, which is measured in terms of bolívars. 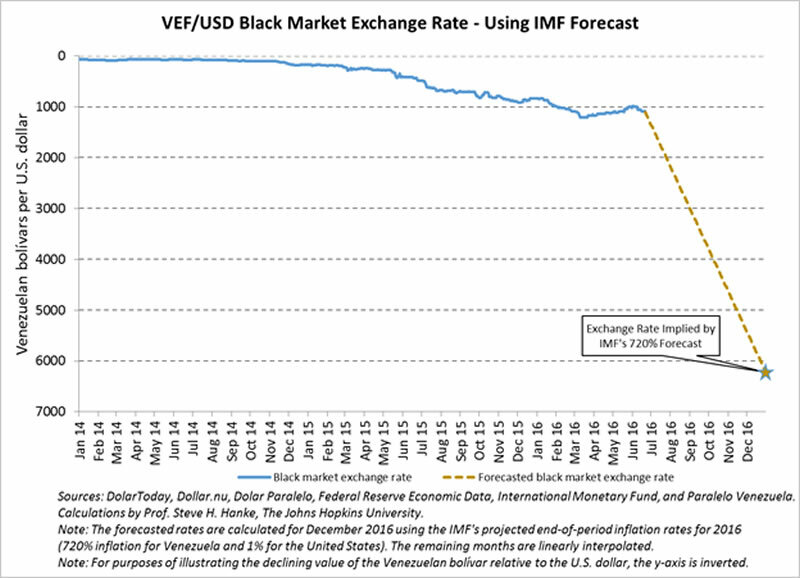 This bolívar metric must be converted into U.S. dollars at the black market (read: free market) exchange rate. This calculation shows that, since the arrival of Chávez in 1999, Venezuela’s real GDP in dollar terms has vanished. The country has been destroyed by Chavismo. So, where is Venezuela going? According to the International Monetary Fund’s (IMF) forecast, inflation will be 720 percent by the end of the year. We can reverse engineer the IMF’s inflation forecast to determine the bolívar-greenback exchange rate implied by the inflation forecast. When we conduct that exercise, we calculate that the VEF/USD rate moves from today’s black market (read: free market) rate of 1079 to 6,218 by year’s end. So, the IMF is forecasting that the bolívar will shed 83 percent of its current value against the greenback by New Year’s Day, 2017. The following chart shows the dramatic plunge anticipated by the IMF. Venezuela is clearly in a death spiral. The only way out is to officially dump the bolívar and replace it with the greenback.